This story originally appeared in the “Against The Grain” November issue of BIKE. After chatting, backslapping, hand-shaking and catching up, the riders clip in. The motley posse of out-of-towners, new riders and the old guard skids into Fennway–an homage to 94-year-old Mary Fenn, who owns the land where some of the trails are built. 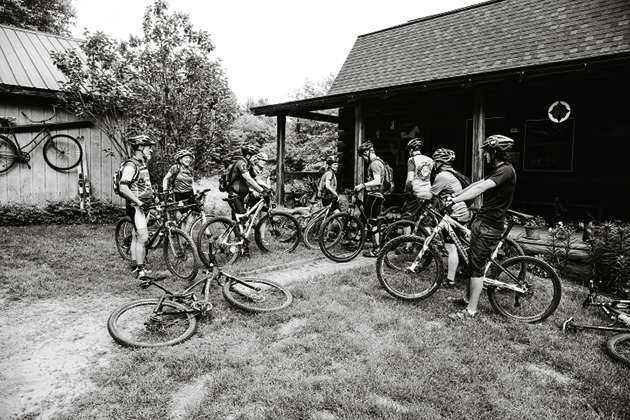 THE TUESDAY-NIGHT RIDE IN BROWNSVILLE, VERMONT, IS NOT your standard bro gathering. Most of the riders are old-timers with gray hair and wrinkles. They've built the hundreds of miles of unmapped trails that wind through the woods of Windsor, Ascutney, Brownsville and Hartland, and they've joined the 'TNR' for 20 years. On this evening, along with about 20 others, there's a guy with an oxygen-tank CamelBak. His name is Lou Schmertz, and he founded the TNR 23 years ago, rousing riders with a weekly poem revealing the meeting time, location and post-ride plans in prose. It's been years since Schmertz has been on a bike–he was hit by a drunk driver in 1991–but he's here to greet old friends and make new ones. "The TNR started because of the riding, but it's continued because of the friendships," says Schmertz. "The variety of people is wide, and the bond is strong." A group called 'STAB,' the local mountain-bike club with an unfortunate acronym, took over the TNR when Schmertz stepped down. Now 66-year-old Jim Lyall, who has built more than 50 miles of singletrack over the past two decades, is the ride's unofficial bard. He is as adept with words as he is at riding. After chatting, backslapping, hand-shaking and catching up, the riders clip in. The motley posse of out-of-towners, new riders and the old guard skids into Fennway–an homage to 94-year-old Mary Fenn, who owns the land where some of the trails are built. An 'A group' is out of sight by the first trail junction, as riders pick up the pace on Good Living Dunn Wright–another nod to the prop- erty owners who allow access. At the front of the 'B group,' Lyall has pressed ahead. He is bushwhacking a reroute because the landowner has decided she doesn't want bikes using her driveway to access the trail. There are good-natured groans from members of the group, who know they'd have nowhere to ride without Lyall and his contemporaries. Lyall takes it all with a smile. And fill our mugs with brew."